Rabbi Shmuel Rabinowitz, the rabbi of the Western Wall and the Holy Sites of Israel, is sharpening his tone against the Women of the Wall, warning that the monthly prayers held by the liberal Jewish group at the Jerusalem holy site may lead to a war between brothers. Earlier this week, the Women of the Wall were joined by female Knesset members who prayed at the Western Wall wearing prayer shawls. The rabbi defined the incident as "a difficult sight which has not been seen at the Western Wall plaza since its liberation." According to Rabinowitz, the women "chose to turn the Western Wall into a protest site, and bring brothers against brother to create an unnecessary conflict." He said that their activity at the women's section offended worshippers and was done in violation of a High Court ruling and the opinion of the attorney general, which stated that they can pray according to their practice at the nearby Robinson's Arch site. "This crossing of lines will bring to Jerusalem the war between brothers, which has already destroyed the city in the past," Rabbi Rabinowitz warned. "The Western Wall is the only place shared by all Jewish people – and it is not the place to force or express a worldview." He further called on anyone who cared about the Western Wall to "leave the disputes outside the plaza, and let the people of Israel one have place where there are no protests, clashes and hostility between brothers." MK Aliza Lavie (Yesh Atid), who in principle supports a change to the current situation at the Western Wall, protested Tuesday's incident as well. "As Knesset members we must set a personal example in maintaining the law," said Lavie. "Knesset members' participation in the activity of the Women of the Wall, while blatantly violating a High Court ruling and despite the police's objection, is a serious step conveying a message to the public that High Court rulings and police decisions can be seen simply as recommendations." MK Eliyahu Ben-Dahan (Habayit Hayehudi) joined the condemnations as well, defining the incident as a "provocative act." "I am puzzled by anyone who praises the superiority of the rule of law, especially public leaders who must serve as a role model for maintaining and upholding the rule of law, and instead act against a High Court ruling. "I expect the law enforcement authorities to enforce the decisions made by the High Court and attorney general," MK Ben Dahan said. 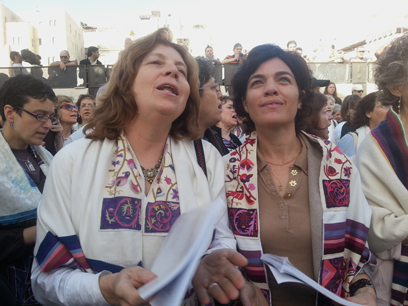 Women of the Wall Chairwoman Anat Hoffman said, "In every generation one must re-liberate the Western Wall. We are committed to the hope that the Western Wall will serve as a bridge connecting all denominations of Judaism and will be a place symbolizing religious pluralism, which every Jew – whoever and wherever he is – will be able to feel part of." Responding to lawmakers' criticism, Hoffman added: "The regulation in the Protection of Holy Places Law, for which the Women of the Wall were detained, determines that anyone holding a religious ceremony not according to the place's custom and offending public feelings faces a sentence of up to six months in prison. But the Women of the Wall, after more than 24 years, are part of the place's custom. "We reject the narrow interpretation of the law, that the place's custom is determined by the Western Wall rabbi and haredi extremists, whose views reflect only a very small handful of the Jewish people," she said, arguing that "even among the haredi people there is a change towards religious pluralism in the Western Wall." Rabbi Gilad Kariv, executive director of the Israel Movement for Reform and Progressive Judaism, expressed his support for the MKs who joined the prayer. "By standing with the Women of the Wall, the Knesset members convey a clear message to all those who believe the Western Wall should be managed like a haredi synagogue, and at the same breath, that women should not serve as Knesset members. "This is a clear statement that the battle over the Western Wall does not only belong to those women, who seek to pray at the holy place in their own way, but to the entire public of women in Israel and to all Israelis who believe in equality and freedom of religion and conscience," Rabbi Kariv added. Last month, Israeli police detained 10 women, including the sister of American comic Sarah Silverman, as they tried to pray at the Western Wall. The detentions took place after about 300 people gathered at a prayer service at the Western Wall to protest Orthodox control of the site. Among the worshippers in the group, Hoffman said, were about 100 male supporters, including veterans from the legendary Israeli paratroopers' battalion that captured Jerusalem's ancient walled Old City, including the Western Wall, in the 1967 Six-Day War. Prime Minister Benjamin Netanyahu recently turned to Jewish Agency Chairman Natan Sharansky in an effort to reach an agreement that would end the dispute over the Western Wall's religious nature, so that each and every Jew would be able to visit and pray at the site according to their faith. In January, the Israel Movement for Reform and Progressive Judaism, women's organizations and various pluralistic movements petitioned the High Court of Justice, demanding the disbandment of the Western Wall Heritage Foundation and that the management of the site is taken away from the hands of the Western Wall rabbi. The groups argued in the petition that "the separation and modesty requirements at the Western Wall have turned the plaza into a haredi prayer site." See all talkbacks "Rabbi: Women of Wall leading to war "